You might think singing isn’t for you, but would like to show support for the choir in other ways. Great! We would welcome your support and below are some ways in which you can help. Simply email us using the contact form on the right. We have established a mailing list called ‘Friends of Vox Holloway’. 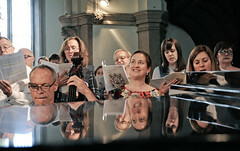 Use the contact form to the right if you’d like to be given regular updates on the choir’s work in the Holloway community, news about upcoming concerts so you can purchase your ticket early and we’ll let you know about social events we’ll be holding. If you make a donation, we can claim Gift Aid. 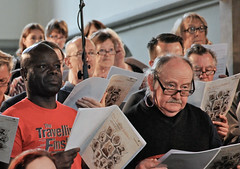 Since January 2013, Vox Holloway has been a registered charity (“N7 Community Choir”, number 1150514). We are registered with HMRC, which means that we can claim Gift Aid on donations. 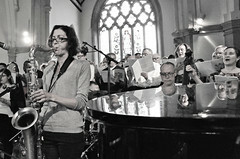 Making Music, the membership organisation for amateur music groups of which we are a member advises us that this can also includes choir subscriptions. We have created a form that allows us to treat your past, present and future donations as subject to Gift Aid, which makes any donation (including for rehearsals) worth an additional 25%. Please sign up and complete the form! Vox Holloway is hoping in future to become a ‘Charitable Incorporated Organisation‘, we are waiting to see when the legislation will be passed. Our next concert is in March 2017 when Vox Holloway will be singing Lost & Found, a concert of 18th-century music written for the orphans of London and Venice, featuring Handel’s From Harmony and the Foundling Hospital Anthem, Vivaldi’s Gloria and A Particulare Care by Harvey Brough. An advert in our program will be available at great rates and will reach over 400 local people. If there are other ways you think you can support us, please do let us know by sending us an email by using the contact form to the right. 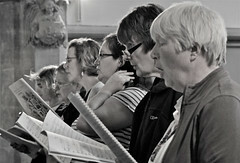 And of course, you can join us as a choir member!